A rare chance to learn this brilliant, simple but obscure method of knitting. Let’s keep this old Yorkshire craft alive! For its opening weekend, the Yorkshire Museum of Farming is holding a Country Crafts event, and I’ll be doing talks (more of that down the week) and two workshops, one on each day. What is this thing, a ‘knitting stick’? 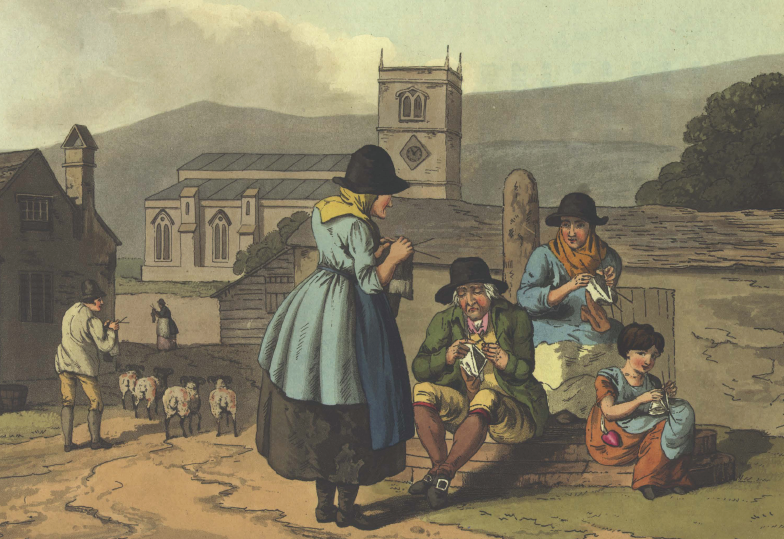 Knitting sticks were widely used by Yorkshire knitters from the seventeenth century to the twentieth. It was usually a piece of wood with a hole drilled in it, used to anchor the working needle. This made knitting faster and less strain on the wrists. There is a knack to using a knitting stick. It is useful for folk who do living history, also people with some disabilities, or who are prone to repetitive strain injuries, can benefit from using a knitting stick. They’re great for traditional knitting – Arans, gansies or Fair Isle but also fantastic for knitting contemporary designs ~ jumpers, socks, hats or gloves. Whether you knit in the round or on two needles, learning to use a knitting stick will speed up your knitting and improve your tension. Saturday April 5th, and Sunday April 6th. Workshops are part of the museum’s Country Crafts weekend, so plenty of other things to see and do at the Museum. Bring: yourself, and a belt (or apron with a waistband). You’ll tuck your stick into this. Materials will be provided at workshop. We will loan you a stick, and needles, on the day, for you to learn with. But feel free to acquire your own and bring them along. Needles: if bringing your own, 8” or longer stainless steel dpns are best. We will loan on the day though. NB: We won’t be knitting a set project, just learning the technique – so you can bring along something you’re already working on (if you have dpns for it, 2 or 4 as appropriate) or just bring yourself and a belt! So long as you can cast on and knit, you can do this workshop. You can buy knitting sticks or belts from Handmade Things. Shetland knitting belts are also available from Jamieson & Smith, the Shetland Wool Brokers. You’ll leave this workshop knowing how to knit using a knitting stick (sheath) or belt, so you can then take this useful technique and run with it… (Don’t run with needles, though! Not very sensible) . Workshop places are limited, so pre-book to avoid disappointment.